Gus: Normally, we don't promote catnip use with our students (many kittens don't react until at least 6 months old) but tonight they crashed our nip party. Things may have gotten a little out of control. Somehow that seems appropriate with the Beatles Kittens. I just hope we got some selfies for our Sunday Selfie Blog hop and that nothing is too embarrassing! 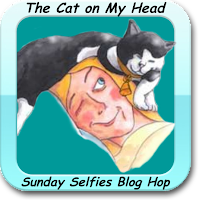 We are participating in the Sunday Selfie Blog Hop hosted by our friends at The Cat on My Head. Please hop on over to see the other entries. Hello kitties. Our first time here. Who are you both? We are Emma and Buster. Thanks for visiting Emma and Buster! I'm Gus - the brown tabby. I run a school to train foster kittens to be good adoptable family members. My sister, Pearl and my brother, Jaq help teach. Our current students are the Beatles Kittens - John, Paul, George, and Ringo. LOL, that looked like it was a great party. Have a great Sunday. MOL, maybe the band should be renamed the Rolling Stoned (on nip) Beatles? Anyways excellent non embarrassing selfies this week. You are so psychedelic. What a lovely bunch. Ooh, that looks like one fun and psychedelic party! Happy Sunday! I'd say you all inhaled, amiright? We can neither confirm or deny. Uh oh! They're too young for an intervention!